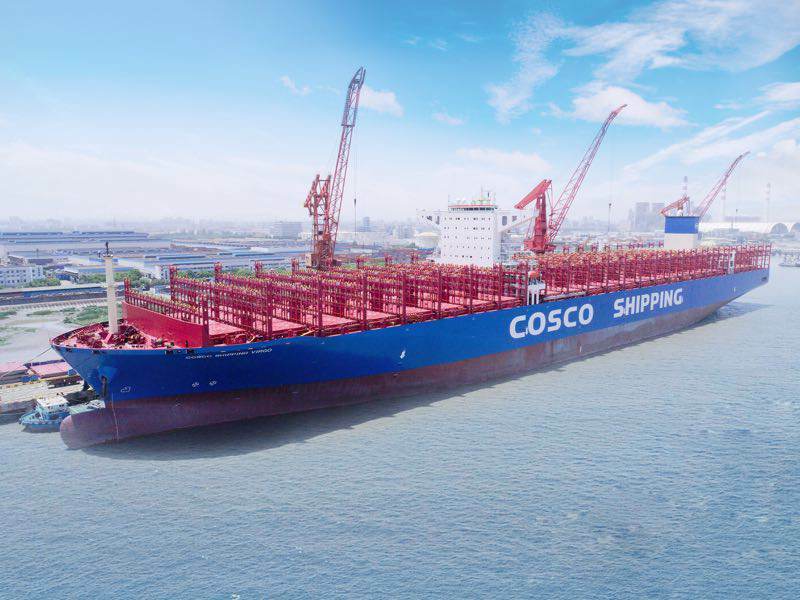 A 20,000 TEU container vessel was delivered by Shanghai Waigaoqiao Shipbuilding Co., Ltd. (SWS) to COSCO SHIPPING Lines Co., Ltd after a naming ceremony on May 29. 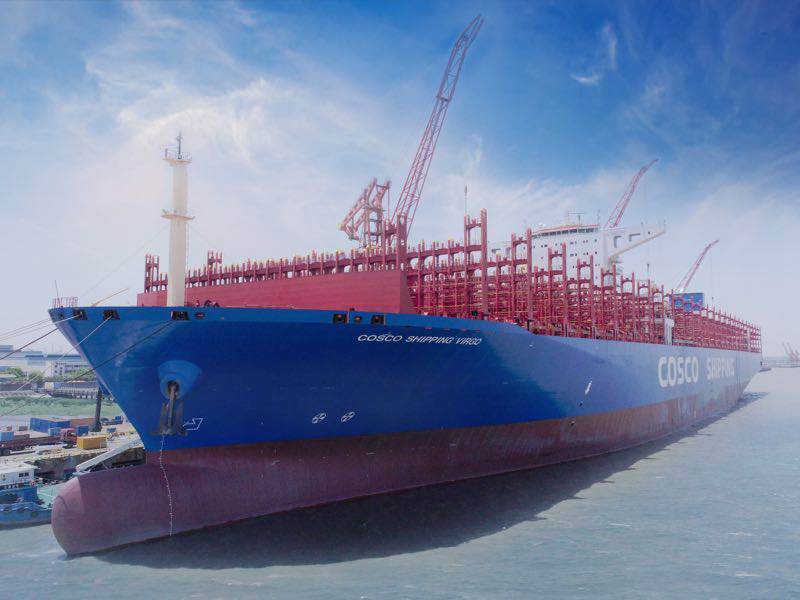 It was the third mega ship delivered by the SWS this month, following two 40,000-ton Very Large Ore Carriers (VLOC). The vessel has a length of nearly 400 meters and a width of 58.6 meters. With a maximum draft of 16 meters, the vessel can sail as fast as 22.5 sea miles per hour and load up to 200,000 tons. The area of the vessel’s deck is four times the size of a standard soccer field. However, the ship’s gigantic size is not at the sacrifice of its economic efficiency. The vessel is equipped with large-diameter and highly efficient propellers, as well as a full balance, energy-saving rudder, actually lowering energy consumption during operation. 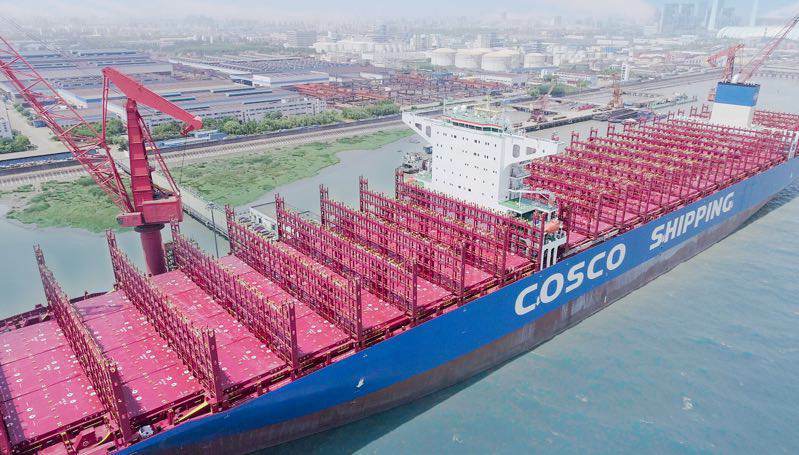 So far, a total of 79 vessels above 19,000 TEU have entered operation in the world, and 58 more have been ordered. China received 17 of these orders, accounting for 30 percent of the global share. China’s tech giants Tencent and Alibaba remain among the top 10 brands in the world, according to the 2018 BrandZ Top 100 Most Valuable Global Brands list released by WPP and Kantar Millward Brown on Tuesday. A total of 14 Chinese companies are now in the top-100 brand list. E-commerce platform JD and express delivery company SF were both ranked for the first time. The ranking has the highest credibility in reflecting brand position. It is concluded based on surveys from more than 3 million consumers, as well as financial and business performance reviews of each brand. 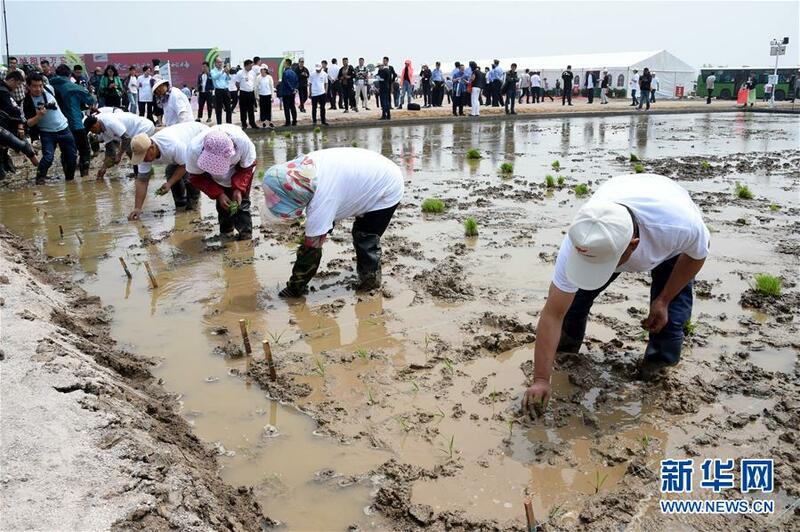 “It’s not surprising for Chinese brands to have made such remarkable achievements given the increased national power and exploding market over the past 40 years of reform and opening up,” He Maochun, director of the Research Center of Economy and Diplomacy in Tsinghua University, told Global Times on May 29. According to the report issued by Kantar Millward Brown, this year witnessed the fastest growth of non-U.S. brands, and subversive Chinese brands have made a huge impact. The value of Chinese brands is up 47% since last year, twice the figure of their U.S. counterparts, the report added. An article published on Tuesday by UK magazine Marketing Week said that Alibaba saw a 92 percent rise in brand value, rising five positions since 2017 into ninth place; fellow retailer JD increased brand value by 94 percent putting it at 59th on the list, while alcohol brand Moutai’s brand value jumped 89 percent taking it to 34th. These brands are the three fastest risers this year, the magazine added. On Tuesday, CNN also pointed out that Jack Ma’s Alibaba has seen its brand value nearly double to $113 billion as the e-commerce company expands further into fields such as mobile payments and cloud computing. Shenzhen-based Tencent broke into the annual BrandZ top 10 in 2017, going from strength to strength over the past year. It now holds fifth place behind Google, Apple, Amazon and Microsoft – but above Facebook – with a brand value of $179 billion, up 65 percent compared to last year. It boasts a market capitalization of $490 billion, making it worth more than America’s most valuable bank, JPMorgan Chase. Doreen Wang, the head of BrandZ, told CNN that the rise of China and savvy young consumers has created opportunities for smart entrepreneurs. More and more young Chinese consumers are falling in love with domestic brands, she explained. “While entering into US markets may still be at a preliminary stage for both brands, other regions are embracing them,” she said. A national poll of America’s 18-to 29-year-olds conducted by Harvard’s Institute of Politics, located at the Kennedy School of Government, found that 67 percent of young Americans are worried about the future of their country. The survey also shows that about 54 percent of respondents think things in the US are “on the wrong track”. Over half consider themselves to be neither politically engaged nor politically active. Another poll of 15- to 24-year-old Americans has found that the young Americans are not interested in politics, nor do they like public protests. About 55 percent of them think negatively of public protests, with words such as “counterproductive” and “violent” being used to describe them. Dan Cox, US Public Religion Research Institute’s research director, said recent protests in the US garnered a lot of media attention, but this hasn’t really led to young people adopting positive attitudes towards them. Learning how to cook at a cookery school is normal, but it’s not often an option for students at other universities and in other majors. 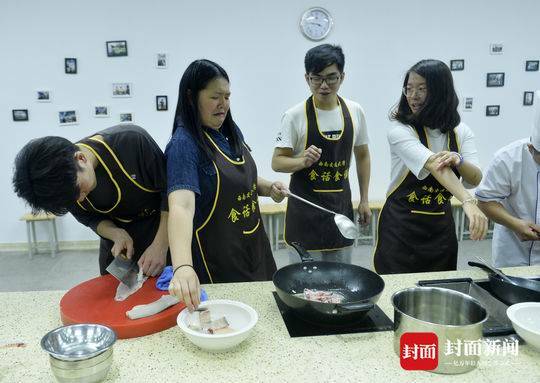 Starting this year, Southwest Jiaotong University in the Chinese city of Chengdu has made cooking an optional course, which is brand new for students there. Though the class has already reached its maximum capacity, many students continue to ask if they can apply or even just be present in the classroom. A teacher surnamed Yu said the classroom was renovated out of the school’s canteen, so it’s well-facilitated in order to help with teaching. Students can use the cooking facilities as they could do at home, the teacher said. 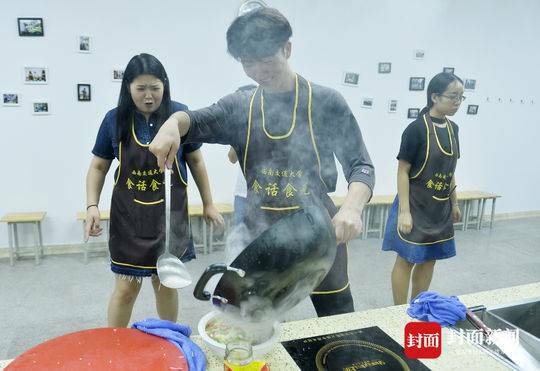 He disclosed that each week 10 teachers, who all have more than 20 years of experience in the field, will show students how to cook one or two dishes. 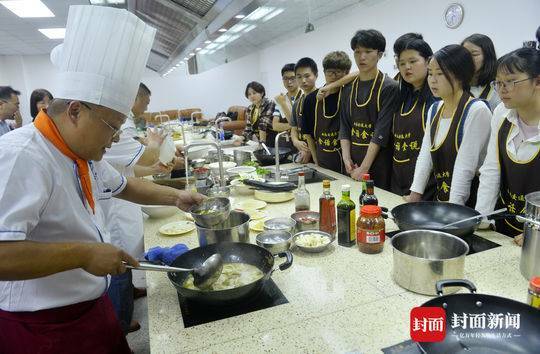 The students will not only learn theoretical knowledge and the history of Sichuan cuisine, but also learn to cook well-known Sichuan dishes such as Mapo Tofu and poached spicy slices of pork. When the semester is over, the students will cook in front of their teachers and the food will be scored by how it looks, smells and tastes. The score will go towards their course credit. Students said they’ve not only learnt how to cook, but also enhanced communication with each other during the learning process. Southwest Jiaotong University is known for opening a number of creative courses other than cooking, such as handicrafts. 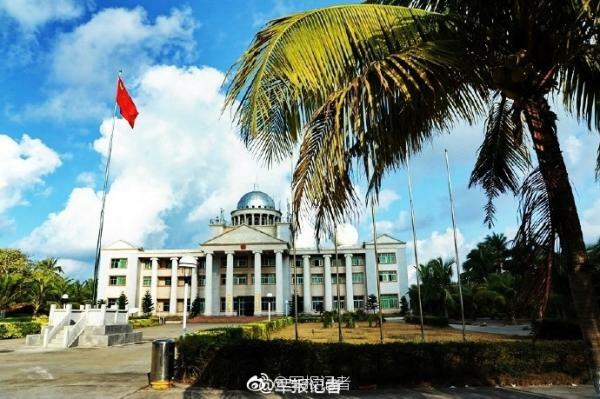 The optional courses have improved students’ hands-on skills, taught them to respect labor workers, and helped them understand traditional Chinese culture and customs of different places, said a teacher at the university. Imported goods are in strong demand among Chinese consumers, said a recent report issued by China’s Ministry of Commerce (MOFCOM). According to the report, foreign products make up over 30 percent of the total consumption for more than a fifth of people asked. 36.1 percent of the cosmetics purchased by those surveyed were imported, and the figure stands at 27.3 percent when it comes to passenger vehicles, the report revealed. Over 90 percent of the consumers consider safety the most important reason for buying foreign food products and child care supplies. 70 percent also believe that quality remains the largest factor in the purchases of imported leisure, sports and culture products, as well as cosmetics and household supplies. The report pointed out that 31 percent of those surveyed plan to increase their consumption of foreign goods over the next 6 months. 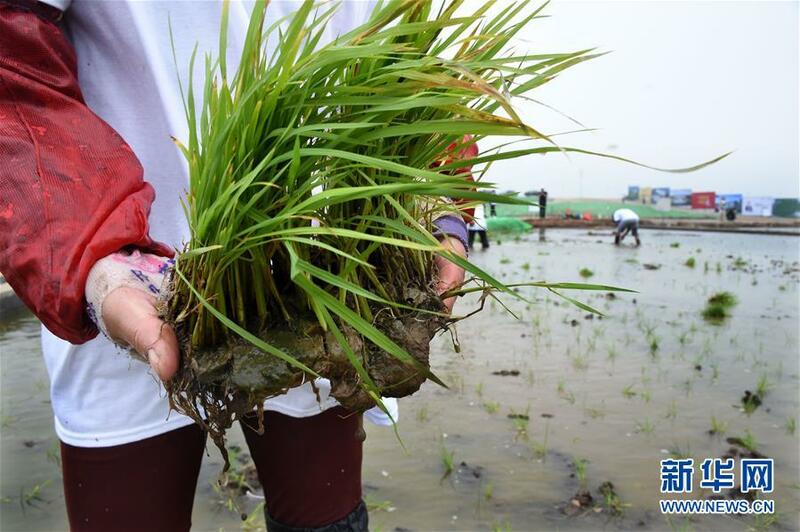 In addition, Chinese enterprises are also taking steps to expand imports, the report said. 34 out of the 92 surveyed merchandise categories expressed a strong desire to increase imports in the next year, including in healthcare, milk, perfume, glasses and new energy vehicles. 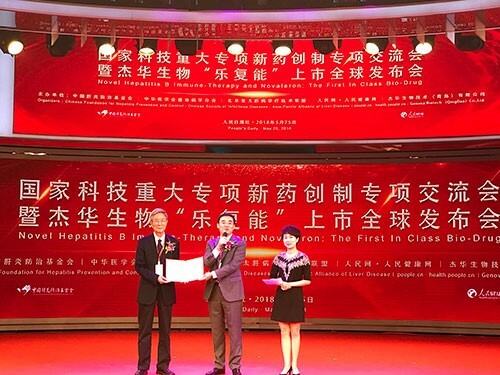 A new pharmaceutical drug for hepatitis B was launched in Beijing at a conference on May 25, People’s Daily reported. 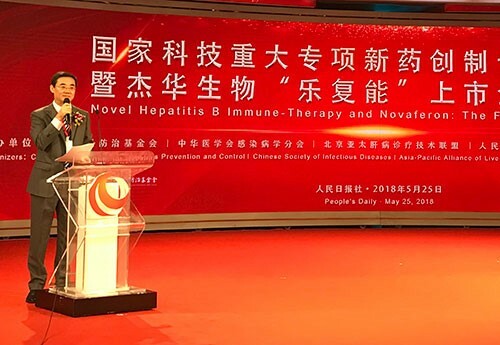 The drug, Novaferon, will give hepatitis B patients new options and marks a breakthrough in China’s creation of advanced protein biotechnologies, said Yang Xizhong, executive vice president of the Chinese Foundation for Hepatitis Prevention and Control. Liu Longbin, CEO and president of Genova Inc. and general manager of Genova Biotech（QINGDAO) Co,. Ltd. delivers a speech. 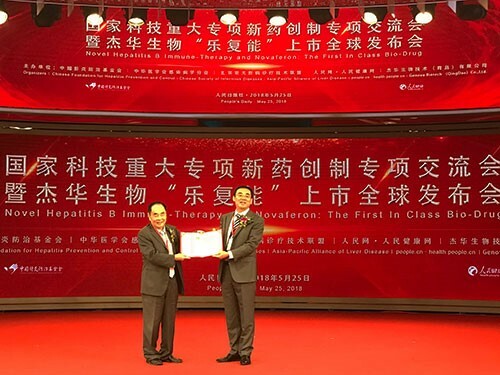 Wang Guiqiang, director of the Infectious Disease Department at Peking University First Hospital, believes that the new medicine is a fantastic weapon for clinical doctors when it comes to immunotherapy, and he expects more patients will benefit from the new drug. It is hoped that more experts of hepatopathy can support the experimental research of Novaferon after its launch, in a bid to promote the formulation of guidelines dealing with the hepatitis B virus. Liu Longbin (right) issues a letter of appointment for lifetime consultancy to academician Hou Yunde (left) of the Chinese Academy of Engineering. Liu Longbin (middle) issues letter of appointment for lifetime consultancy to academician Wu Zuze (left) of the Chinese Academy of Engineering. Based on figures from 2015, the World Health Organization has already hit global targets to reduce new cases of viral hepatitis by 90 percent and is set to achieve 80 percent treatment coverage for chronic hepatitis B and C patients by 2030. According to Liu Longbin, chairman of the drug’s manufacturing company Genova Biotech, the company has a vision to only make “first-in-class” medicines. He said only by innovation can a company grow into a world-class biotech enterprise. After showcasing its poetry skills, AI is now catching up with humans in its ability to both write lyrics and sing songs. On May 16, “Microsoft Little Ice”, an AI of Microsoft, announced via her Weibo account that after being trained, her singing capability is fast approaching that of her human counterparts. The AI released her newest single via the Chinese version of Twitter on the same day. By May 25, the song had received more than 1,800 comments on NetEase Cloud Music, China’s leading music platform. Little Ice was praised for being able to interact with listeners and write good lyrics. Nicholas Jing Yuan, a senior scientist with Microsoft, said Little Ice had been able to take part in the song writing and sang it all by herself. He said the AI’s ability to compose lyrics came after tens of thousands of practice attempts. He went on to disclose that to begin with, her lyrics were hardly understandable. About 10 million lines had been written and then abandoned during the training, Yuan revealed. Training the AI to write songs was one thing; but getting her to sing was another. In order to make her sing naturally, scientists trained Little Ice to sing under various models, which were made as close as possible to the AI’s voice and singing style. The AI has also been trained to breathe while she sings to make her resemble a human being as much as possible, said Luan Jian, chief voice scientist on Little Ice. 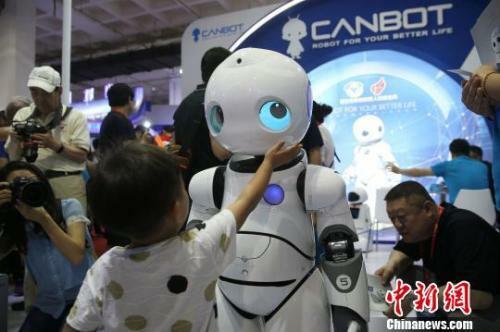 Yuan said emotion and innovation have helped to make such progress. 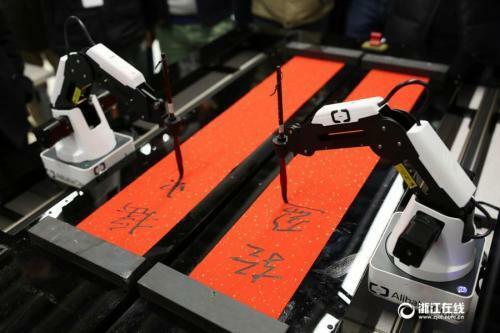 He hopes the AI will help people get more creative in such areas as song writing. Little Ice has already mastered how to write a poem. According to reports, the AI has studied all modern poems written by some 519 poets dating as far back as the 1920s. Global manufacturing of the FIFA World Cup 2018 mascots has come to an end, as the last mascots rolled off the production line at a factory in south China’s Guangdong province, May 24. The factory was designated to produce mascots by Hangzhou Fude brand management company, the only agency authorized to produce and sell the mascots outside Russia. Fude quickly found more than 30 factories to produce the mascots on Alibaba’s subsidiary 1688.com. The platform has also helped factories produce mascots based on demand. “Our factory had been operating nonstop, but this huge order was still beyond our production capacity,” said head of a toy factory in Dongguan, Guangdong. In order to finish the work on time, the factory distributed the task to other branches, also via 1688.com. 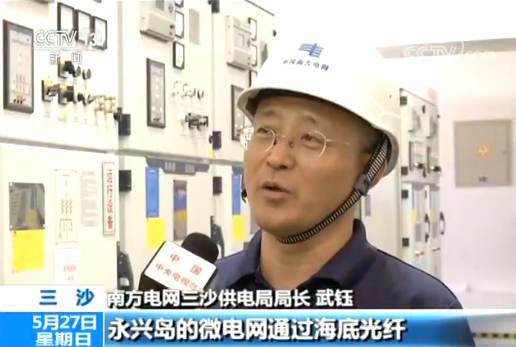 Li Hong, chairman of Fude, said the mascots are an outcome of the Internet. The manufacturing of the mascots is also a trial of the “Made in Internet” concept proposed by Alibaba’s founder and chairman Jack Ma.